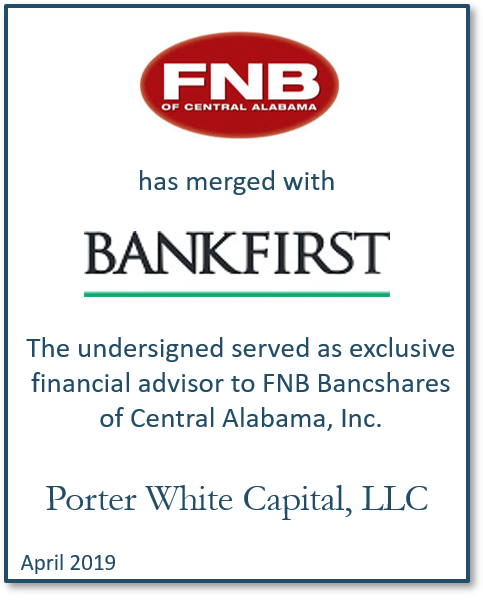 BankFirst-FNB of Central AL Complete Merger - Porter White Co.
On April 1, 2019 BankFirst Capital Corporation of Columbus, MS and FNB Bancshares of Central Alabama, Inc. of Tuscaloosa, AL announced the closing of their merger that combines two well-respected banking franchises. The merger creates a $1.3 billion institution and expands BankFirst’s presence in Alabama, including the vibrant Tuscaloosa market. Porter White Capital, LLC served as exclusive financial advisor to FNB Bancshares of Central Alabama, Inc. and its subsidiary, FNB of Central Alabama. Porter White has advised on six Alabama community bank mergers since 2016. For more information on how we can assist your bank with its merger and acquisition needs, please email Michael Rediker or call him at (205) 458-9135. Securities offered through Porter White Capital, LLC, member of FINRA/SIPC and a wholly owned subsidiary of Porter White Companies, Inc.